The temperature of your pool is important for a few key reasons. You obviously want it to be warm enough be comfortable enough to get in but you also don’t want to make sure that it is too hot or enable bacteria to rapidly grow. Due to this, getting the best pool thermometer is important. In order to get the best swimming pool thermometer there are a few important features to consider such as if you want it to be solar powered, how accurate it is and also if it features any alarms that are going to be able to alert you to danger. In our buying guide we will explore those key features in further detail and we have also completed a pool thermometer review on the 10 best products available. Once you have read through this guide, you’ll know how to get the perfect thermometer for you. We love this thermometer for your pool. Firstly, there is no need to install any parts in your pool. Less contact with the water means less chance of something going wrong. Your thermometer is also not in contact with the chemicals of your pool. Secondly, you do not even have to put this digital thermometer anywhere near the water. You can check the temperature of your water from a distance. Simply, point the laser at the water, press a button, and your temperature will pop up on the screen. This thermometer is also very versatile. You can use it to measure the temperature of almost anything. It is great for measuring the temperature of food when you are cooking or barbecuing. When you are performing maintenance on your car or home, you can check the temperature of whatever you are working on. Pretty much anything you can take a temperature of, you can do it with this thermometer. You can measure the temperature from as low as -50 degrees Celsius to +380 degrees Celsius. This thermometer also gives you great accuracy. You have a 12 to 1 ratio of distance to spot, giving it a more accurate reading that most of the competitors on the market. This means that you do not have to get right up beside your pool to measure the temperature of your pool water. The laser will also read the temperature of the water quicker than most other pool thermometers. The laser will help to guide you, and instead of just pointing the thermometer and hoping that you are hitting your target, the laser will show you exactly where you are targeting. Once you have hit your target and got the temperature of your pool water, the result will be displayed on the LCD screen. The screen is backlit to give you clearer reading. If you forget to turn the screen off after reading your temperature, then the screen will turn off automatically. This helps you to save the battery life of your unit. 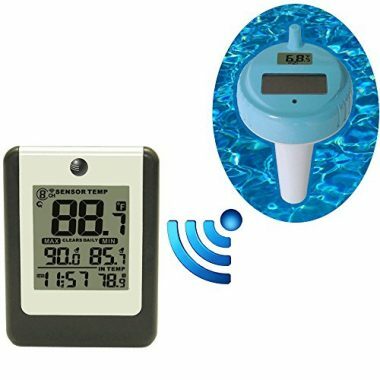 You do need a 9V battery to use this pool thermometer, and you will find that you will not need to replace it often as the screen is not going to stay on and drain the battery. We love the grip on the thermometer. It makes it easy to use, and the handle conforms to your hand when you are holding it. You really cannot go wrong when you are using this thermometer. There is also the option to switch between Celsius and Fahrenheit at the touch of a button. This thermometer is built to be durable. It is a thermometer which you can store safely in your pool room, and bring it out every so often to check the temperature, though, with the functionality it offers, you will not want to limit yourself to only checking the temperature of your pool. You will want this thermometer with you at all times. In fact, you may even want to buy two of them with how versatile and functional these devices are. If you are looking for an easy to use thermometer, then this is the one for you. There is no need to get into your pool to install this device. You also do not need to go to your pool to measure the temperature of it. You can read the temperature at a distance, and save some of your valuable time. This pool thermometer is an affordable choice for your outdoor pool, indoor pool, hot tub, spa, Jacuzzi, pond, and more. 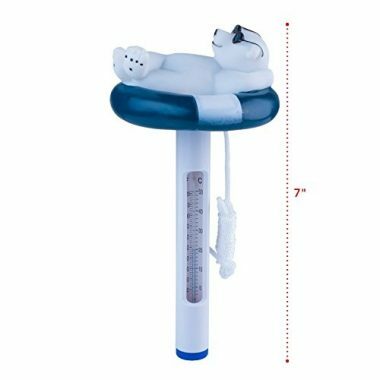 We love the little polar bear floating on top of the thermometer, and children will love seeing the little guy floating around your pool. The thermometer is 7” tall, and works by floating in your pool to read the temperature and display it on an analog scale. Once you have the float in the water, you should wait at least two hours to allow the thermometer to display the correct temperature. Once the temperature stabilizes, it is easy to read the scale. All you need to do is remove the float from the water and take a look at the scale. You will see the temperature instantly. The float is made from durable ABS plastic, which will last you through the heat of the summer season and the cold of the winter season. You do not need to worry about this thermometer being damaged as it moves around your pool. 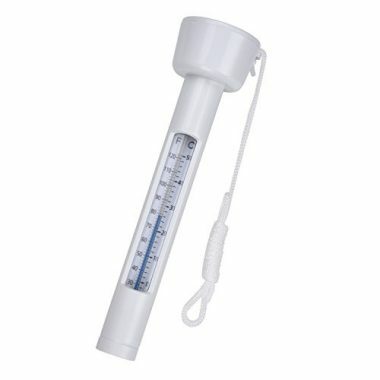 Children can jump into the pool and splash about, and this thermometer will hold up. You can tether the float to a particular spot in your pool, and use the string to access the thermometer easily. We love that you never need to worry about batteries with this pool thermometer. The scale is easy to read, and there is nothing to get in the way of you getting an accurate reading. This thermometer floats in your pool to give you temperature reading in Celsius and Fahrenheit. Once the temperature has stabilized, you only need to pull this from the water to get a quick and accurate reading. This thermometer has been built from the most durable materials, so you do not need to worry about the thermometer shattering or becoming damaged. The durable materials will also hold up to any season. We like anything which does not need batteries to operate. You do not need to worry about much going wrong with this thermometer, and it could not be easier to use. Drop it into your pool, and pull it out when you need a reading. The great thing about this pool thermometer is that you do not need to go out to your pool to check the temperature. With the wireless capabilities, you only need to install the thermometer in your pool, the receiver in your home, and you can read the temperature anytime you want. The thermometer is easy to install. Take the sensor out of the box and place it in your pool. The sensor will float and constantly monitor the temperature under the surface of the water. When you install batteries in the receiver, you can turn on the search mode, and it will find the sensor in the pool. When it finds the sensor, it will sync with it and display all the information you need. The receiver will tell you the exact temperature of your pool, and it is easy to move between Fahrenheit and Celsius. The receiver will also give you the time, the max temperature, and the minimum temperature. The min and max temperatures will reset daily. With this information, you can track how the temperature of the pool fluctuates through the day. The temperature will also update every 60 seconds. This information helps you better track the heating and cooling of your pool, allowing you to adapt your heating and filtering system to give you the optimum savings on energy and power. The feature we love most is the 8 channels. If you have one pool, then this pool thermometer will work great, but it is when you have multiple pools, that this thermometer really comes into its own. You may have an outdoor pool, indoor pool, hot tub, and more. You do not want to have to buy multiple thermometers and then have to read them all. If you had to go to each pool to read the temperature of each, then it would take up a lot of your time. If you had to use multiple receivers, then it would take up a lot of space inside your home. With this thermometer, you only need to buy additional floating sensors, and you can have them all sync with the receiver. There are 8 channels, which means you can have 8 sensors. At the touch of a button, you can scroll between the information of multiple pools. This pool thermometer will give you an accurate temperature reading for your pool, but it is when you have multiple pools that this thermometer becomes essential. 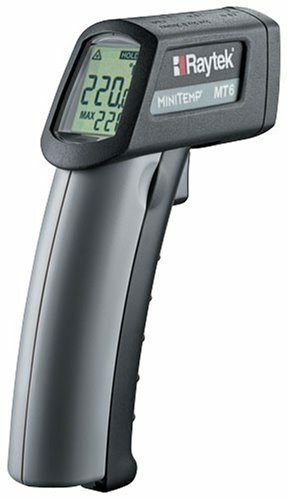 This is another handheld pool thermometer which is extremely easy to use. It is also a thermometer which can be used for more than just measuring the temperature of your pool. 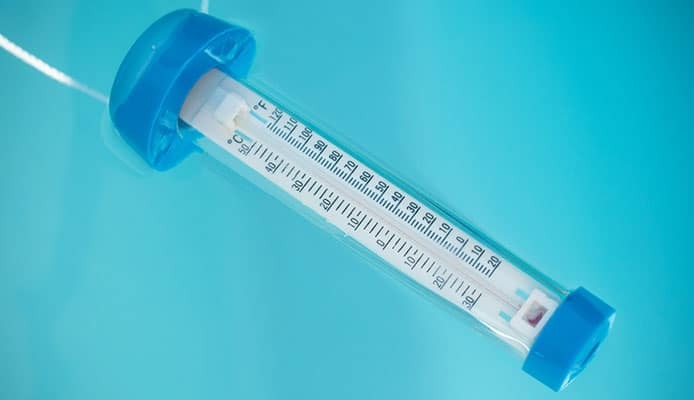 You can use this thermometer to measure almost anything, though if you are taking the temperature of people or animals, you should be aware that the actual reading may not reflect the actual temperature of the animal of person. To use this thermometer, you first need to turn it on, and then point it in the direction of the object you want to measure the temperature of. The unit has a built-in laser which will show you exactly where you are pointing the thermometer. This helps you to get an accurate reading by taking the temperature of an exact region. When you have the device pointed at the area you want to be measured, you will get the temperature almost instantly. We love that you can quickly measure different regions of your pool. It may be that the area near your pool heater is showing a comfortable temperature, but the area on the other side of the pool might be too cool. This device can help you to troubleshoot any problems in your pool, such as your pool heater not being powerful enough. The thermometer comes with a protective boot to add some durability to the device. The ergonomic design has also won design awards. This unit will feel comfortable in your hand, and even though it will only take you a few seconds to get your temperature, the focus on design is appreciated. This model is extremely comfortable and very accurate. You can measure from -30 degrees Celsius to +500 degrees Celsius. The LCD is large and, and the contrast makes it easy to read. The device takes a 9V battery, but the power usage is so low that this will last you for a long time. This is a great pool thermometer if you want something which is easy to use, and versatile. You do not need to be beside your pool to measure the temperature. We love that you can use this device to read the temperature of almost anything. Whether you are getting a pool cleaner, a thermometer or a pool fence, you want it to last. When we buy them, we are not thinking about ever replacing them. The truth is that threefold be a chance that we have to replace them. Pool thermometers are not like traditional thermometers. They are not used for a few seconds and then placed into storage. A lot of pool thermometers are used constantly. They give real-time updates on the temperature of the pool. These thermometers, and even the ones which are not used constantly in your pool are exposed to water and the chemicals in your pool. Anything which is exposed to chemicals on a regular basis is going to break down quicker than a device which is not. Water can get inside your thermometer, and there is also the chance that the thermometer will be exposed to the sun for long periods of time. When you are choosing your pool thermometer, you obviously want to choose one which has the best parts and materials possible. The price of your product will be a factor in this, as you will have a budget for your thermometer and the quality of the thermometer will fall into this bracket. What you do want to look for is a good warranty. Something is likely to go wrong with your product at some point, and of that is in the first few years of its lifespan, then a warranty will have you covered. If you do not get a product with a warranty, then you leave yourself open to having to pay for repairs or replacing your thermometer altogether. When you are buying a pool thermometer, it is worth spending a little more to get yourself at least a one-year warranty. You never know what is going to happen with a pool accessory, especially one which is in contact with the water all of the time. Many pool thermometers will come with a warranty, and you could get a five-year warranty. Even if you only get a warranty on parts, you can really save yourself some money and hassle. A pool thermometer is an accessory for your pool, but you should also keep in mind that the pool thermometer can come with its own accessories. The more you can get with your thermometer, the better, but you should also keep in mind that simpler may be better. If you are looking for a simple thermometer which will give you the temperature of your pool at a glance, and nothing else, then you want a thermometer with no additional accessories or features. If you want something which is state of the art, and will do more than just give you a temperature reading, then you will want to invest in something a little more powerful. Some thermometers will come with installation equipment, while others will not. If the thermometer is easy to install, then this may not be a problem, but if it takes a little bit of work to install your thermometer, then you may want to look for a model which has everything included. You will also find that some models come as a stand-alone thermometer, and you have to buy the receiver separately. This gives you the option of combining it with any receiver. Others will come with everything you need, while some will come with multiple receivers. Your choice will be dieted by your needs. When you are shopping for a pool thermometer, you want to get the best value for money. Find the models which fall within your budget, and then look for the optional accessories within that. If you do not need any other accessories, then you do not need to worry about finding anything more. Whether it is solar panels for sailboats or a solar pool cover, using the energy from the sun can save you a lot of money. This is a very simple choice and will often come down to the price. You will mainly find two types of pool thermometers. Some will take advantage of the natural power of the sun to power the unit, while others will use batteries. Solar-powered thermometers will generally be more expensive than battery-powered, but they will also cost less to run over the course of its life. Solar-powered thermometers will cost you more at the start, but over time they will end up saving you money. 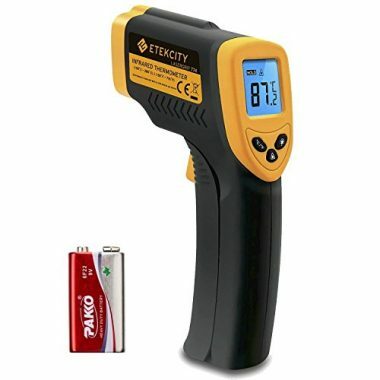 Battery-powered thermometers are cheaper to buy, but you need to replace the batteries every so often. This is an expense which you need to factor in when you are buying your thermometer. Of course, you can cut down on battery costs if you use rechargeable batteries. The best thing about solar-powered thermometers is that they are eco-friendly. They do not draw any power from a battery source. They do not drain any of our finite energy. Instead, they draw from the abundance of the sun’s power. If you combine your thermometer with a solar pool heater, then you can begin to save some real money. When you invest in solar power, not only are you getting your energy for free, but there is no need to manufacture batteries, saving more of the world’s energy. When you buy a pool thermometer, it will already be calibrated for you. There should be no need to calibrate it further, though, if you do notice that the temperature seems off, then you may have to calibrate it. Some pool thermometers will not be able to be calibrated, and you may need to find a replacement thermometer. If your thermometer is able to be calibrated, then refer to the instruction guide for how to do this. Some digital thermometers will come with an alarm. Just as a pool alarm will alert you of anyone is accessing your pool, a pool thermometer alarm will alert you when the temperature of the water reaches a certain temperature. If your pool thermometer comes with an alarm, then you will be able to set it to alert you when the pool becomes too hot or too cold. 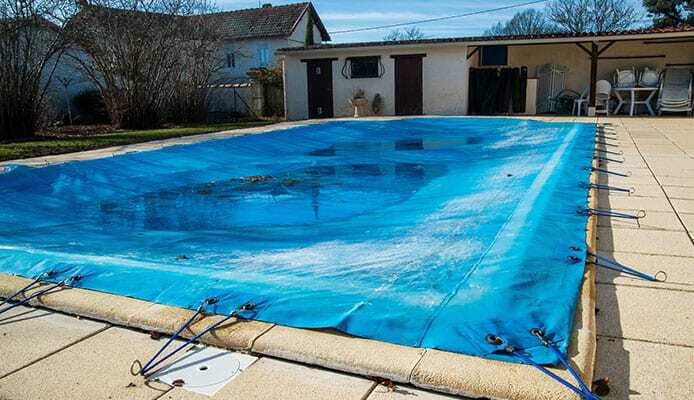 This is ideal if you are not going to be using the pool for a long period of time, and will not be able to feel how hot or cold your pool is getting. It also helps you to better manage the water quality and basic pool chemistry. Q: Why Do I Need A Pool Thermometer? A: It’s important to know what your water temperature really means and a thermometer will help with that. You specifically need a pool thermometer over a regular thermometer to ensure the safety of your pool. 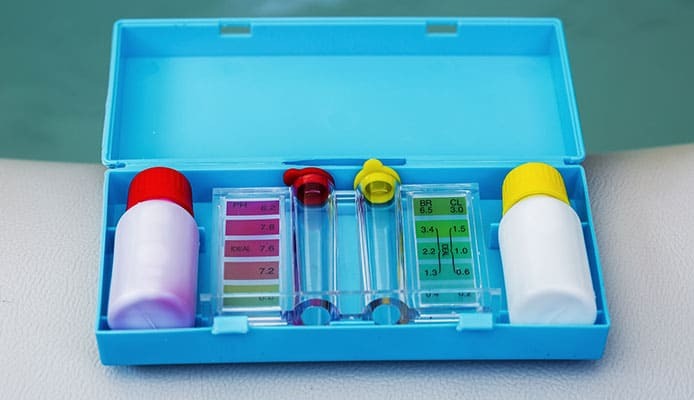 If you use a regular thermometer, then you run the risk of contaminating your pool but can always use a pool test kit to check water quality. Traditional thermometers may have mercury or alcohol inside them. If the thermometer is not completely sealed, then those contaminants could escape and get into your pool. 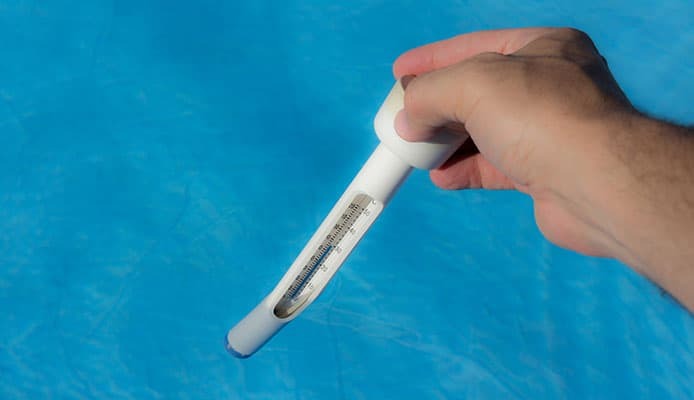 Regular thermometers are also not designed to withstand the chemicals in your pool. Long-term exposure to pool chemicals could cause the materials in a regular thermometer to break down over time. Regular thermometers are also not built to withstand use in a pool. If a regular thermometer breaks, then you could get some glass and other foreign bodies in your pool. Regular thermometers are also not built to give you an accurate reading in pool water. They usually need contact with skin or the air. If they are in contact with the water, then the reading is not going to be accurate. With a pool thermometer, the design is there to protect them in the water and give an accurate temperature reading. They will also be protected against damage in the pool. If a regular thermometer is moving with the flow of water in your pool, they may become damaged if they hit the edge of the pool or any other hard object. Pool thermometers have been specially made to withstand this damage. There are many benefits to investing in a thermometer which is suitable for your pool. They make it more convenient to track the temperature in your pool and set the exact temperature. This is especially important for when you have kids swimming in your pool. Pool thermometers have also been designed to be easy to use. With many thermometers, they are designed to track the temperature of many different things. With a pool thermometer, you know that you are getting an accurate reading, as the thermometer has been designed to only track the temperature of the water. A pool thermometer is accurate and fast, especially the digital ones. Most digital thermometers will update every 30 seconds, giving you real-time information about your pool. They are also a lot more accurate than any other thermometer you could put in there. If you are trying to balance the chemicals in your pool, then it can be beneficial to know the exact temperature. Pool thermometers are also extremely compact and small. When you have lots of pool floats and water toys in your pool, you do not have to worry about the pool thermometer taking up too much space. Q: Types Of Swimming Pool Thermometers? A: There are two main types of pool thermometer: digital and analog. Which one you choose is entirely up to you, and both come with advantages and disadvantages. Analog thermometers are the thermometer you will be most familiar with in this world. They have a mercury strip which will expand and contract with the heat and cold. When the metal shifts, it will correspond with the temperature, and there will be a scale down the side for you to read. When the temperature goes up, the metal will expand upwards, and when the temperature drops, the metal strip will contract and move downwards. It will stop when it reaches the temperature of the surroundings. A digital thermometer will read the temperature of the pool, and display it digitally on a screen for you. There is usually a probe, or something else, which sits below the surface of the water and monitors the temperature. The temperature on the screen will change to reflect the temperature of the probe. Some digital thermometers are also wireless. One part sits permanently in the pool, while the other part can be placed up to 100m away. This means that you can monitor your pool temperature without having to go out to your pool. There are also some advanced thermometers which can be used with an Android or iOS app. Instead of needing to have a separate unit to read the temperature, you can use your smartphone to monitor the temperature of your pool, no matter where you are. The great thing about using an app is that you can also hook your smartphone to the other accessories in your pool, and manipulate the other aspects of your pool at the touch of a button. There are also other types of thermometers within these types. When you are choosing the type of thermometer, you will also want to choose how it attaches to your pool. Some thermometers hang on the side of your pool or are attached outside of your pool with a probe hanging down. Other thermometers float in your pool. You can attach hanging thermometers to places like your pool stairs, while the floating thermometers will float on the water. When you are comparing the types of pool thermometers, you will get a more accurate reading for a digital thermometer. They have more advanced sensors than an analog thermometer. They also give you a reading on a screen, and there is no way for you to misread a digital thermometer. With an analog thermometer, your reading could be off if you are holding the thermometer at an angle. Digital thermometers are also more expensive than analog ones. They have more parts and technology inside. Analog thermometers do not have any fancy sensors or electronics inside so they will last longer. 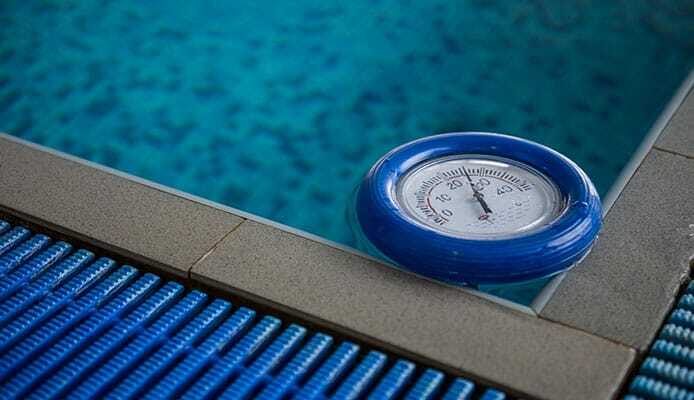 Digital thermometers will begin to break down, the longer they are in the pool. Hanging thermometers are a more permanent addition to your pool. Floating thermometers are easy to use, as you can remove them once you get your temperature reading, but hanging thermometer will give you a more accurate reading as they are not sitting on the top of the water like floating thermometers. On the other side, a floating thermometer will last longer. Q: How Temperature Affects Pool Water Quality? A: If you let the water in your pool get too hot or too cold, then you run the risk of damaging your pool. Your pool water should remain at a constant temperature, and there are a number of reasons for this. One of the main reasons for this is for the comfort of your pool users. There is no reason for having a pool in your backyard if people are not going to use it. A pool which is too hot is not going to attract pool users for long, and a pool which is too cold is not going to create a relaxing and welcoming environment. If you keep your pool at a constant temperature, you are going to create a great environment for your swimmers. The secondary reason for keeping your pool at the correct temperature is to create an environment which is safe and healthy for your pool users. The warmer your water gets, the more likely you are going to have bacteria grow. Bacteria love warmth, especially in wet environments. As the water gets hotter, bacteria begin to thrive, and your chlorine is eaten up. All of the chemicals in your pool are thrown off balance. You do not want people swimming in a pool with harmful bacteria. Even before the bacteria have had a chance to grow, a pool which is too hot can be detrimental to the health of swimmers. If you stay too long in a pool which is very hot, you can become dehydrated. This is the same as staying in a hot tub for too long. You also run the risk of muscle cramps and overheating. If you keep your pool at a warm temperature, then you can avoid all of these problems. You also run risks if your pool is too cold, not only are people going to be put off from staying in your pool for too long but if people do go swimming in your pool, then they run the risk of health problems. People who already have heart problems can run the risk of making them worse, but even people who are in the greatest health of three lives can be affected by the cold water. As the seasons change, your pool temperature is going to fluctuate. You need to keep track of the temperature of your pool to ensure that your pool is welcoming and safe. A thermometer from our list will help you to track the temperature of your pool and will help you to keep your pool safe. A pool thermometer will give you the chance to change the temperature of your pool before anyone gets into it. The optimum temperature for your pool is 28 degrees Celsius. You can have it a degree or two cooler for children to swim in. Accurately monitoring the temperature of your pool can ensure that your pool remains comfortable for everyone to use and also as safe as possible. When it is you will be able to simply have fun with the likes of your pool slides and pool floats. Without a thermometer you cannot accurately maintain your pool temperature and balance the chemicals. Take the time to find the pool thermometer which fits your need and once you do you never have to guess the temperature ever again.